Lavanila Vanilla Lemon Roller-Ball is on the top of my list ! My favorite scent is Vanilla !!! I have been searching for a mature vanilla perfume that was not fake, artificial, foody, or chemical smell. Lavanila Vanilla Lemon Roller-Ball is pure vanilla with a tint of fresh lemon. The roller-ball is so convenient. I love using the roller-ball!! The main benefit to using a roller-ball is the no waste to the product. The amount of perfume that comes out with one swipe is pretty sizeable and a perfect amount. Roll it on the area you want to apply and smell fresh and sensual! The packaging is travel friendly. I can place it in my purse, desk drawer or even my glove compartment in my car. The delicious, warm scent is long lasting. This is one of the best and sexiest vanilla and lemon scents I have worn! Lavanila Vanilla Lemon Roller-Ball does an amazing job of providing richness and depth as this warms and becomes part of your skin. You can wear it on its own or it makes a wonderful base to complement to other notes. I thought the lemon scent would be overpowering and it is not! I got so many compliments from Lavanila Vanilla Lemon scent. No parabens, petrochemicals, phthalates, silicones, propylene glycol, mineral oils, synthetic dyes, sulfates, chemical sunscreens or aluminum….. Just juicy lemon blend combined with pure Madagascar vanilla for a sophisticated, clean fragrance. Lavanila Vanilla Lemon Roller-Ball is on the top of my list! I could smell the amazing aroma as I was opening the package. The soaps were Citrus Lavender, Lemongrass Tea and Lavender Calm and I couldn’t wait to use them. The soaps were made from earth. My husband saw them on the counter and asked who they belonged to because he really liked the smell and was curious about them. I told him he could try one . Well, that led to three empty boxes and none for me to try. He has been using them and enjoying them very much. Oh well, I will just have to get a few more bars and hide them this time. What’s all the fuss about? made from earth of course! made from earth organic soaps not only smell fabulous but contain healthy certified organic ingredients. The Citrus Lavender organic soap contains orange essential oil, with hints of tangerine, lemon and lime making a perfect citrus blend. The touch of calming lavender really makes this soap full of aroma. Did you know that the soap contains fresh squeezed citrus with a touch of lavender flowers? Lavender is one of my favorite fragrances and Lavender Calm was made for me. Well, not really but it could have been. Lavender Calm is the perfect soap for sensitive skin and the natural properties of lavender, soften and clean while you enjoy the fabulous aroma. made from earth soaps contain spectacular ingredients like green tea, natural earth sea salt, organic honey, tea tree, a variety of organic berries, organic Aloe Vera and Joboba nut, rose hip and habiscus. made from earth soaps are handmade fresh with USDA Certified Organic ingredients. These blends produce a healthy lather and leave your skin soft and supple. Avon is thrilled to announce its latest fragrance collaboration with award-winning artist Fergie: Outspoken Fresh. An exotic and bold follow-up to Avon’s trio of bestselling fragrances with Fergie, the intoxicating scent captures the exhilarating rush of the stage. John Frieda is excited to announce a partnership that’s very dear to John Frieda Hair Care’s heart. 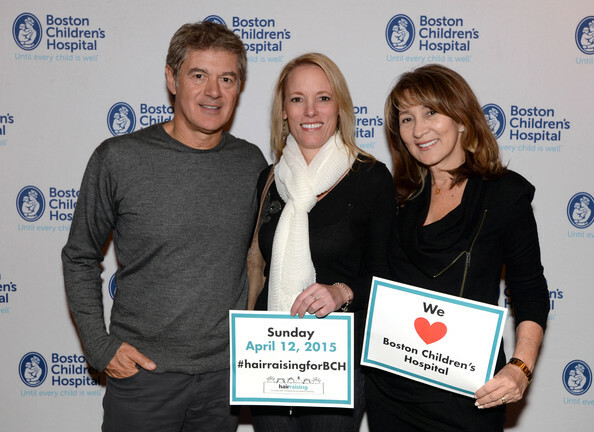 This year, John Frieda Hair Care is supporting HAIRraising (www.hairraising.org), an organization created by the founders of the brand, John Frieda and Gail Federici, to benefit Boston Children’s Hospital. The hospital is the number one pediatric hospital and research center in the nation and HAIRraising aims to raise one million dollars in 2015 to help sick children in need. On Sunday April 12th, salons around the country will be participating in a cut-a-thon to raise funds. Participating salons offer discounted cuts all day (appointments and walk-ins) with all proceeds benefitting the cause. In addition to the brand’s monetary donation, John Frieda Hair Care will be hosting a cut-a-thon at the new Serge Normant at John Frieda Salon in Chelsea. Cuts will be $80 for the day (normally they start at $125). We urge you to participate in this important organization! Remove your polish and let your toenails breathe for a good few days. If toenails look discolored, squeeze some lemon into your foot lotion or rub lemon wedge directly onto nail to brighten nails. Mix a few cups of warm whole milk in a bowl with vanilla essential oil followed by an exfoliating scrub to remove the dead skin. Avoid using pumice stones since they trap bacteria and use a diamond file instead for those extra rough spots. Apply a shea butter lotion or non-greasy cream to lock in moisture; use Vaseline or light vegetable oil on the heels to prevent cracking. Begin painting! Apply a cuticle oil to the base of your toenails (or even when they are already polished), focusing around the cuticle area to hydrate and bring moisture into the skin, helping the polish last longer. Celebrity Manicurist Skyy Hadley helps you get your feet bright and ready for Sandal Season! Has the thought of spring and summer been on your mind, lately? Well, it’s not quite time to whip out the summer slides just yet, but there is no harm in prepping our toes, so they are nice and pretty when the time does come! Plus, it is kind of embarrassing trying on new sandals at the shoe store, and everyone noticing your not-so-done pedicure. Get ready for sandal season with Skyy Hadley’s tips on how to moisturize, hydrate and perfect your feet for the warmer months ahead! • Remove your polish and let your toenails breathe for a good few days. If toenails look discolored, squeeze some lemon into your foot lotion or rub lemon wedge directly onto the nail to brighten them. • Mix a few cups of warm whole milk in a bowl with vanilla essential oil followed by an exfoliating scrub to remove the dead skin. Avoid using pumice stones since they trap bacteria and use a diamond file instead for those extra rough spots. • Apply a shea butter lotion or non-greasy cream to lock in moisture; use Vaseline or light vegetable oil on the heels to prevent cracking. • Begin painting! Apply a cuticle oil to the base of your toenails (or even when they are already polished), focusing on the cuticle area to hydrate and bring moisture into the skin, helping the polish last longer. Give your feet a little “love” with these wonderful tips from Skyy. Not only will you feel terrific, but your feet will look great in all those new sandals as you enjoy the upcoming warm weather seasons! Thank you, Skyy for, once again, sharing your expertise with us. Skyy Hadley is a celebrity manicurist and pedicurist at her As U Wish Nail Spa. Set the foundation for your foundation with Kiehl’s Pore Tightening Uplifting Concentrate. Lightweight, easy to apply fast drying and feels great! Want to learn more about it? Check out my YouTube video here! Your beauty is their passion! Hair & Nail Creations Salon in Wildwood, FL is all about giving their clients the the best of the best with no exceptions. Owner/ stylist Annette Campetela Fredericks opened her 18 years ago and has become one of the most visited salons in the area. With 6 chairs 3 nail techs and one eststichian walking into Hair & Nail Creations feels like your right at home. While in the salon last week, everyone from the receptionist to Annette herself was all smiles, laughing and really making the whole place feel inviting. That to me is a salon that you can just tell cares. They care that their clients will walk out with a smile and they care about themselves as stylists to make sure that always happens. Continuing education, attending trade shows and even influening the stylists to watch how to videos in the back room. That shows that even the greats now that there is always something to impress on. Even in the midst of wanting to be the best salon they can be, Hair & Nail Creations also opens their arms to support other salons. Having friends who own their own salons, Annette said something that shows just what a success she really is. She said she would rather be the person who helps others get to the top of the ladder than be famous for doing it. She has done that. Tsking one of her stylists from the backroom to the showroom who is now working as an editorial stylist & not asking for anything in return. (accept awesome hair lol) That to me is the true definition of success. So next time you are in Wildwood FL or just to check out more on Annette and her team check out www.hairandnailcreations.com and follow them on FB! Author, international makeup artist and television personality Dimitri James is the founder and man behind Skinn Cosmetics. From his innovative Skinn treatment products for face and body, to his Skinn color and makeup creations, Dimitri James is always spot on with exceptional products and cosmetic solutions that are easy to use and apply! . This one of the best palettes I’ve ever used personally, and as a makeup artist. I’m amazed at how quickly I’m able to achieve a finished and balanced eye look. When I’m on location doing makeup, the palette saves me a lot of time! It also imparts a flawless appearance on all different types of eyes. It’s blendable, with four very compatible shades, and very easy to apply, Skinn’s Wake up Big Bright Eyes Palette adapts beautifully to just about everyone! •Brow Gel: My eyebrows are sparse. Using the brow gel, I’m able to shape and fill in my brows with ease. They look great all day and never look penciled in or unnatural. The gel is a very versatile color that you can apply, as needed to suit your particular eyebrow needs! Use the angle brush that is included in the palette to enhance your brows. • Eye Highlight Color: Next brush the light soft pink shadow on your complete eye area from lid to brow. Use the shadow brush that’s on the other side of the angle brush. • Line & Define Color:: Your final step is lining and defining your eye. You can use the angle brush or a liner brush with the Cocoa shade. Follow the shape of your eyelid right by your lashes for a precise, clean line. Smudge the line a bit for an attractive softly defined shaping. I’ll sometimes enhance the outer corner of my eye lifting deeper color up into the crease of my eye for a little more drama. With these colors, I’ll still maintain a natural appearance. That’s what I think is so remarkable about the Wake Up Big Bright Eyes Palette, The colors work so well together! Lightweight and hydrating, making it a smart choice for the sensitive under eye area. It still, however, gives a nice pick me up so you won’t have to worry about the undereye darkness, which often occurs when you wake up with tired eyes on those mornings when you haven’t had enough sleep. It’s a must have for an afternoon touch-up, and just what you need for a little lift before an evening out on the town! You’ll find many uses for this versatile highlighting brightener! Dimitri’s Skinn Contour Pro gives your face a natural sculpted look. Remember dark recedes, and light accentuates. I’ll usually apply the darker color to the contour of my cheek bone and just under my jaw bone. I’ll then place the lighter color from the outer corner of my eye area to my temple for a lifting and highlighting effect! Once again, the word subtle applies to the Skinn Contour Pro. I like to use my fingertips to apply and blend, but there are brush options as well. The Skinn Contour Pro palette is another must have to achieve that picture perfect finished look. Take a moment to watch this video of Dimitri James actually applying Skinn Contour Pro on a model. It’s a very informative visual presentation! (Click the “Skinn Store tab” on the website page to view and purchase the Skinn products. Shopping Television Network, EVINE Live is seen in the USA. Dimitri James makes appearances on EVINE Live. Here you’ll be able to watch Dimitri “in action”, as he shares tricks of the trade, does makeovers, and sells his Skinn Products. Click Watch Us Live to view Dimitri’s live shows right on your computer. Calling all women between 18 & 40!